24hours, 7 days a week for emergencies. VCA Specialists are available on an appointment basis Monday through Saturday to see pets as a referral from your primary veterinarian. 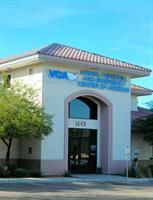 VCA has an excellent team of specialists who are board-certified in radiology, surgery, and internal medicine. They are supported by experienced emergency veterinarians. Their doors are always open and their hospital is always staffed with a doctor. We are located .5 miles south of the Red Mountain 202 on the west side of Country Club Dr.